Figure 1: A strong case for the need of orthodontics. This patient has moderately severe crowded upper teeth; mild crowded lower teeth; maxillary arch constriction; teeth in cross-bite; misalignment; and receding gums. (Image courtesy Thomas J. Melcher, DDS, MS). Patients who have crowded or rotated teeth, or a poor bite relationship between the upper and lower teeth (malocclusion) may benefit from orthodontic tooth movement (Figure 1). 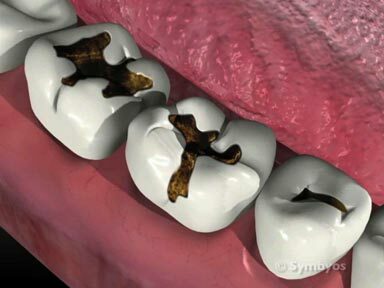 Crowding and misalignment of the teeth makes it difficult to keep them clean, and puts the patient at risk for tooth decay (caries) and gum disease. This is because wherever food accumulates, bacteria thrive; and bacteria cause tooth decay and gum disease. Advanced gum disease (periodontitis) has been shown to contribute to cardiovascular disease (blood vessels of the heart), peripheral vascular disease (blood vessels of the body), poor control of diabetes, and the risk of stroke. It has also been implicated in pre-term childbirth and low birth-weight babies in certain populations. 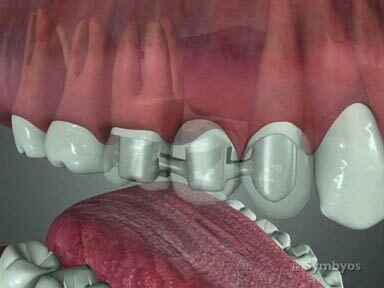 Malocclusion can accelerate wear (attrition) on the teeth, and increase the likelihood of tooth fractures. It can also cause jaw joint (TMJ) pain and dysfunction (TMD), fatigue/pain in the chewing muscles (myalgia), gum recession (from off-axis forces on the teeth); and can be a contributing factor in improper nutrition. Moving the teeth and influencing the growth and development of the jaws, such that they align properly and provide proper support for the lips and cheeks is what orthodontists do. Moving teeth orthodontically can be done with fixed braces, adjustable retainers the patient can remove, or rigid acrylic positioning trays. Influencing the growth and development of the jaw and facial bones may involve use of externally applied forces (e.g. headgear appliances), adjustable appliances that are worn in the mouth, dental implants positioned as temporary anchorage devices for orthodontic devices (TADs), palatal expansion devices, and other mechanisms. Figure 1a: A panoramic radiograph allows the dentist to assess a patient’s growth and development status, check for missing or extra teeth, and evaluate the teeth and bones of the facial area for disease processes. Figure 1b: A cephalometric radiograph is a type of X-ray image showing the bones of the skull, mandible, and cervical spine, as well as the teeth. The orthodontist measures the relative position and angles of certain bones, and of the teeth to determine the extent and type of orthodontic treatment needed by the patient. (Image courtesy Thomas J. Melcher, DDS, MS). Tooth movement is best accomplished with light forces applied to the teeth over as much time as is necessary to move them. It can take as little as a couple of months to move just a few teeth, or as much as a couple of years to move them all. Some patients may require early orthodontic treatment to influence the growth and development of their jaws while they still have primary (baby) teeth. For some of these children, no orthodontic tooth movement will be necessary later. For others it will be. Many times, orthodontic treatment begins while the patient is in their mixed dentition years (some primary and some permanent teeth are present), around the time of puberty. Other times, a patient is treated many years after their growth and development is complete—even into retirement years. Adult orthodontic treatment has become very popular in recent years. Regardless of the timing of orthodontic treatment, many aspects of the process are common to all patients. The first orthodontic visit is often a screening appointment, to assess at a high level whether orthodontic treatment would be appropriate for the patient, and when it should begin. At this appointment, the orthodontist will look into the patient’s mouth, and evaluate the patient’s plaque control (oral hygiene), bite relationship, number of decayed, missing or filled (or otherwise restored) teeth, and the health of the gums (periodontal health). He or she will review the patient’s health history. A patient must be medically and dentally stable before orthodontic treatment is undertaken. If a patient is considered appropriate for orthodontic treatment, the next appointment is usually what is known as a diagnostic records appointment. Panoramic and cephalometric X-ray images (Figures 1a and 1b), and impressions of the teeth will be made. The impressions will be used to make stone cast replicas (diagnostic casts) of the teeth. Sometimes other X-ray images will be exposed to assess the patient’s development status. The dentist uses these to assess how much growth is likely to remain (if the patient is still growing). The orthodontist will use all of the information gathered at the screening and diagnostic records appointments to measure tooth size relative to the length of the dental arches; and orientation and relative position of the bones of the face and lower jaw. He or she will determine how much tooth/ jaw movement needs to occur, and will develop a treatment plan for accomplishing the goals of orthodontic treatment given the patient’s unique needs. The next appointment is often a consultation, in which the diagnostic findings are presented to the patient, a problem list is discussed, and the goals of orthodontic treatment are enumerated. The orthodontist will provide his/her recommendations for treating the patient, and will discuss the relevant timing and financial issues. If treatment is agreed upon, and if fixed braces are part of the orthodontic plan, elastic spacers (rubber bands) may be placed between the patient’s molar and bicuspid teeth to make room for orthodontic bands. Options for fixed braces. This patient elected to have tooth-colored orthodontic brackets and arch wires on the upper teeth, and traditional metal orthodontic brackets and arch wires on the lower teeth. Ask your orthodontist if options like this may be available for your individual needs. If fixed braces are to be placed, the next appointment is generally what us known as the banding appointment. At this appointment, the orthodontist places the bands, brackets and arch wires which make up the orthodontic hardware that moves the teeth, and treatment is underway. The patient will be seen at periodic intervals during orthodontic treatment to evaluate progress, and make adjustments/additions to the positioning appliances. Oral hygiene should be carefully monitored throughout treatment to verify that the teeth and gums remain healthy. Your orthodontist or general dentist may prescribe a fluoride gel supplement to further reduce the chance of developing cavities while in braces. It is important to maintain excellent oral hygiene and to see your general dentist as often as necessary to keep the teeth and gums healthy while in braces. A traditional removable Hawley retainer shown on the lower teeth. The small amount of inward rotation visible on the two central incisors may have been preventable with a fixed retainer. It is not uncommon for the length of treatment time to be extended if the teeth are not moving as fast as estimated at the start of treatment. This is especially true if the patient is not complying with all of the orthodontist’s recommendations. When the goals of orthodontic treatment have been met, the braces are removed and the patient enters the retention phase of treatment. In order to move teeth through the jaws, it is necessary to loosen the ligament attachments between the teeth and the jawbone, which is what orthodontic appliances do. Once moved, the teeth need to be held in place long enough for the ligaments to re-solidify. This is done with retainers. Orthodontists commonly retain the lower front teeth with a fixed (bonded onto the teeth) retaining wire. 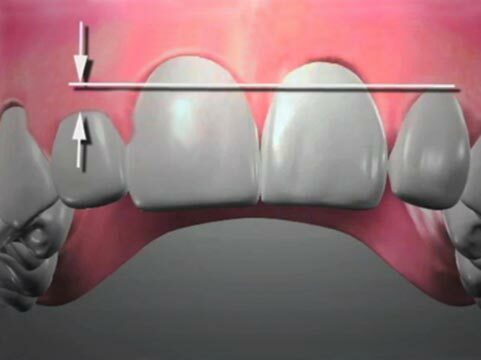 The wire is not intended to be removed by the patient, and may be suggested as a long-term (ten or more years) means of holding those teeth in position. Frequently, the remaining teeth will be retained with some type of removable retainer (it is also possible for the lower front teeth to be held in place with a removable retainer).